Aluminum sprockets are manufactured for applications where saving weight is absolutely critical. Our aluminum sprockets are made in the USA using high-quality 6061-Grade aluminum alloy, also known as 61S alloy. This material is a precipitation-hardened aluminum alloy that contains magnesium and silicone as its major alloying elements. It is typically used to make roller chain sprockets because it has good mechanical properties and offers good weldability. We can supply aluminum roller chain sprockets in any chain size with any tooth, bore, and hub configuration (including idlers). Typical manufacturing time is 10-12 business days but expediting options are available for rush circumstances. We can supply one-off pieces or bulk quantities. 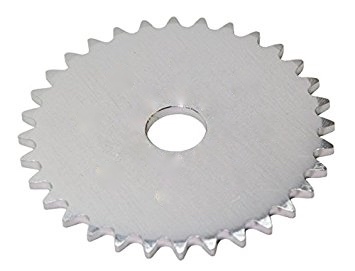 To get a quote on an aluminum roller chain sprocket simply give us a call, or send an email to sales@usarollerchain.com, or if you already have the details on the sprocket you need to fill out the request form below and we will contacting you. Another weight-saving option would be using a plastic roller chain sprocket, these are typically on the shelf along with an extensive line of plastic roller chain, plastic bearings, and plastic chain guide railing. To get a quote on aluminum roller chain sprockets simply fill out the request for quote form and someone from our customer service team will contact you.